Never heard of this, but it definitely sounds good! It really is good. Hominy has such a fabulous chewy texture which went quite well with the soft potatoes. Delicious! Looks great. I always thought hominy hash is made with hominy, but I guess there are versions without it. Hey! Thank you for catching my error! I went in and edited the post. Can’t believe I left out the main ingredient. :) Monday…must have another cup of coffee. I have only made hominy a few times. I like that you added potatoes. I’ll certainly give your recipe a try. Don’t you enjoy the chewy texture of hominy? I have never cooked hominy before and now I’m inspired to make posole. Must go see Amanda’s blog…I bet she has a good posole recipe! Oh, I wish I could get hominy here in Britain! I haven’t had it in ages and this recipe sounds really good. Same with me. I’m surprised you can not find it in Britain. Mexican ingredients are not common in Britain? :) I wouldn’t imagine so. Thanks for stopping by! 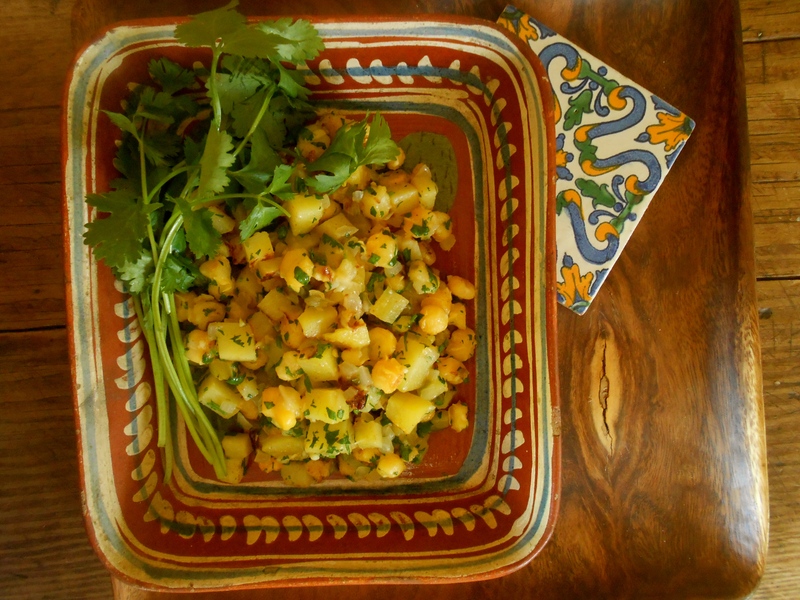 Love the hash, I have never had hominy hash before, I do really like hominy and would love this with poached eggs. YUM! That’s exactly what I said as we were eating it. A poached egg would be perfect. I”m going to make it again this week and put the egg with it! Go ahead and toot your horn, as this dish is a winner! I’ll have to try this out on my family with some eggs on top, as suggested. Yes do! I’m going to make it again for breakfast soon with poached eggs. It’s fantastic…. Did you find it? It’s fantastic! It’s dried field corn kernels. Here’s a good read on it. Got it. Sounds good. Is it common in hash? Never heard of it in hash before. It’s brilliant though. Only really had it in a Mexican soup called posole, which I must make soon! This looks like such a great, flavorful side, especially with that extra kick from the jalapenos! Thank you! You are right, the jalapeños really gave it great flavor. Nice side dish for soft tacos! I really like the idea of a poached egg on top! Happy to see you here Mary Frances! This looks so good! I went on a hominy hunt for a while to get those big corn pieces! I got a can and 2 dried bags from Goya. You and I have such similar tastes for Mexican. I love it! Thanks for the shout out to Jovina about posole! I do have a great recipe, but I think you might too, no?! Stay tuned because I’ve got a Mexican cookie coming up that you will LOVE. Maybe I’ll mail some to you :) Beautiful hash! Love the texture of hominy, I bet this is wonderful. This is my kind of food for sure. I also love you re-create recipes, great job! Thank you! Looks like you are having fun these days…I want to go tequila tasting! ha ha, yes, it was lots of fun! I have to go hominy hunting. I’m looking forward to trying this with a poached egg on top. And I can’t wait to see Amanda’s Mexican cookies. I’m another who hasn’t heard of hominy before. It’s a yes from the picture though. yummo! I didn’t realize hominy was so unknown. I think it comes from the southern part of the US and Mexico. The kernels are twice the size of regular corn kernels. Chewy and delicious! I can almost taste this dish! Lots of flavour in this potato recipe, yummy!!!! A new one on me. Looks delicious though! This looks so delicious Seana! I have to say that I’ve only tried hominy once…and swore that I’d never try it again… but this looks so wonderful, you’ve inspired me to give it another try. I think it was years ago when one of the kids was in elementary school, and she/he signed me up for hominy. I had no idea what it was, nor any idea how to prepare it! OMG Prudy! So sorry to hear this!! Are you up and feeling better? Let’s email…. Holy smokes! Ok. Just sent you an email @ moog. This looks very good and I would like to give it a try, but what is hominy? I’m not sure I would be able to find it around here, is there anything I could substitute it with? Hi Anne. Thank you for stopping by today, all the way from Norway! :) Here’s a little write up about hominy I found online. It has some suggested substitutes as well. This looks great! I love hominy! It’s officially summer with this amazing yellow dish! Yes! It certainly is starting to feel like summer here in Washington State. Really warming up finally. It will be nice to get the first harvest of corn soon. Yellow food is very good isn’t it! You’ve done it again! Hominy. I’ve just Googled, as I know the name but didn’t actually know what it is. If only I was heading back to the States I would have a very lengthy list of foods to try. Wish I could box up a bunch of items and send them to you. Seriously. I was wondering if Latin ingredients are available to you, or Spanish rather. Various dried chili’s, smoked paprika….etc. Here’s an interesting link to for Mexican herbs / spices. I adore hominy, and it’s such an under-utilized ingredient. That looks delicious. You are right, hominy really is an under-utilized ingredient. I don’t see much of it around, but I sure love it. This is a great way to cook it Michelle. I’ve made it twice since I figured it out. Great for breakfast! If only we could buy hominy here in Oz, I would love to give this a try Seana! What a fabulous looking side dish. Very interesting to me you would not have hominy available to you. Seems like so many foods make the trek across the globe. This particular brand I bought is from Mexico. Do you get any Mexico foodstuff? Curious. I’ll certainly have a closer look next time I’m in the supermarket Seana and let you know… We do get a certain amount of Mexican products here, but not nearly the same range as what you’ll find in the USA. I guess I’m more often looking for usual suspects of tacos and burritos etc. and don’t tend to look much further. I’ll be keeping an eye out now though! 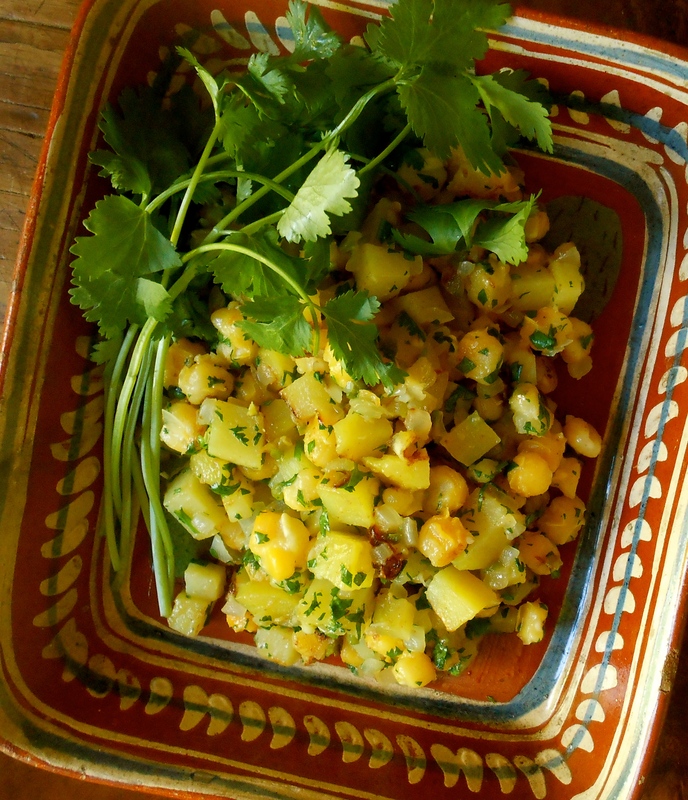 I like hominy but never would have thought to turn it into a hash. Thanks for your recipe, it sounds terrific. I wouldn’t have come up with on my own either Karen. The Mexican walk-up is fantastic and I love everything on their menu. This hash is so delicious and fun to eat! Thank you so much! And for stopping in too! This does look good! I’ve only heard of hominy hash but your review seems very approachable so I will try this soon! Well, well….where have you been? Having seen a post for awhile, nice to hear from you Saucy! Yes, ahem, I’ve been sorting out my non-blogging life (pesky thing), and incidentally getting cooking/baking mojo back. But I’m back!! You are currently reading hominy hash at COTTAGE GROVE HOUSE.